2018 Recycling Update, click here. Please flatten cardboard and exclude any waxed or plastic lined boxes. We only accept corrugated cardboard and brown paper grocery bags in this bin! Just throw into the bin loose. NO bags or twine. NO mixed paper in this bin. Magazines and newspaper go in the same bin. Rinse the jugs and discard the lids. No other type of plastic in this bin. Use the slick paper feel as a guideline. NO mixed paper or books. Magazines and newspaper go in the same bin. Simply rinse these cans. Pop cans, aluminum TV dinner trays, pie pans and food cans are acceptable. Other larger aluminum scrap metal can be recycled at the landfill but not in this bin. Put your used crankcase motor oil in a “clear” non-glass container with a screw top lid. Place jug in tray at the oil collection station. Oil drop-off only available during office hours Mon-Fri 8:00 am - 4:00 pm. -Every 100 gal of recycled oil saves 65 gal of new. For info on the new Electronic Waste recycling click HERE. Rinse the cans and remove the labels. You can recycle the lids from the cans and metal lids from glass containers as well. Food and beverage containers only. No need to remove labels or lids. Any color is ok. Simply deposit them into the window of the bin. NOdishes, light bulbs, mirrors, windows, etc. 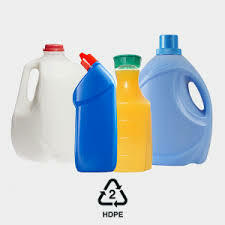 For colored HDPE #2 bottles only. Bin available during office hours Monday-Friday 8am-4pm in our gated area. Rinse the bottles and discard the lids. Call office with any questions.